Nice is a great place to go shopping for the latest fashions; the French Riviera is well-known for its love of the latest trends and there are lots of great places to find affordable and high-end fashion for men as well as women. Here’s our list of 10 of the best. This is a high-end fashion boutique with a great online store, selling everything from designer dresses to the latest beautiful fashion jewellery. 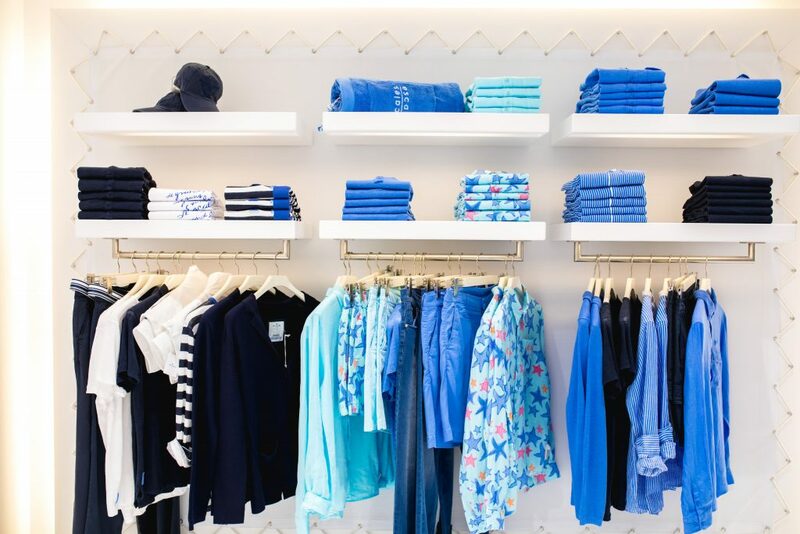 This is the quintessential French Riviera brand, where everything is blue and white – but it isn’t the typical Breton stripey tops or nautical French style. Escales has cool jeans, cashmere tops and chic minimalist, classic pieces. This is a stylish fashion boutique for men, selling famous brands like Calvin Klein and Versace. It’s a great place to find suits as well as shoes. La Fabric Shop is a very swanky men’s fashion house. They have a great online store with free delivery in France over 50€. Weill has about 30 stores in France, mostly in Paris, and a great online presence. It’s cut tends to be a little bit more tailored and it has an international feel. This little shop showcases lots of local designers. It doesn’t have a website but you can keep up-to-date via Facebook. Well worth a visit for the more local end of fashion. People love the friendly service. The Repetto brand is a crossover dance brand that now does high fashion. You’re as likely to see families in here buying very expensive ballet shoes and tutus as you are the aficionados buying Repetto’s take on denim. This upscale boutique sells “prêt a porter” items (ready to wear, rather than tailor made) and you’ll find everything from Chloe to Jimmy Choo. Clothes are in Avenue de Verdun and shoes are in the other shop on rue Masséna. Façonnable is a menswear brand selling mid-range fashion, bridging the gap between designer clothes and high street fashion. It takes its design cues from the French Riviera – specialising in blazers, deck shoes and trousers for a tailored, conventional, upmarket look. No list of fashion boutiques in Nice would be complete without mentioning the famous Galleries Lafayette. It’s one of France’s more chic department stores, well known for its high-end fashion.